Our “One on One” series features artists, writers, poets, curators, and others from around the country, responding to works in SFMOMA’s collection. You can follow the series here. Today our guest is Jill Dawsey, acting chief curator and curator of modern and contemporary art at the Utah Museum of Fine Arts, and former SFMOMA assistant curator of painting and sculpture (2003–6). Lovely to have you back, Jill. I recall puzzling over Vik Muniz’s photograph Spiral Jetty after Robert Smithson, from the series Brooklyn, NY (1997) some years ago. At first glance, I took it to be a reproduction of one of Gianfranco Gorgoni’s photographs of the iconic earthwork. That is to say, I responded precisely as Muniz intends for his viewer to respond. Like so much of his work, the photograph presents an optical illusion, a sight gag: only its title suggests that it in fact depicts a miniature replica of Spiral Jetty built by the artist in his studio in Brooklyn, New York. Today, though, Muniz’s Spiral Jetty after Robert Smithson appears to me as the fake that it is. The scale and perspective seem implausible; the hilly landscape is not quite right. The topographical accuracy of Muniz’s tabletop model is perhaps beside the point of Spiral Jetty after Robert Smithson; he is less interested in the physical drawings and sculptural works he creates than in their afterlives as photographic representations. For me, though, Spiral Jetty has ceased to exist only as an object of my projections and imaginings — as part of my image-repertoire, as Barthes might say — because I have been there eight times now. That’s not a world record or anything, but those visits have served to check the otherwise mythic notions about the Jetty I had in my head. Two and half years ago, when I was trying to decide whether or not to move to Utah to take up a curatorial post at the Utah Museum of Fine Arts, I made a list of pros and cons. “Spiral Jetty” was scribbled near the top of the pros column. I’m not sure exactly what I imagined it meant for the world’s most famous work of land art to serve as an argument for my relocation to the desert. Like most people, I knew the work primarily through photographic images. Spiral Jetty was a slide that flashed during a lecture in a dark classroom. It was a series of film stills reproduced in the 1971 issue of Artforum that I found in a bookstore. It was footage of Smithson running from a helicopter like Cary Grant. It was evidence that in Utah, there might be something like a there there. It was also anecdote and rumor. For most of its life the Jetty had been submerged in the Great Salt Lake, a ghostly coil just visible beneath the water’s surface. Sometime in 2002 or 2003 it reemerged, and people I knew started making pilgrimages to see it. Based on the many pictures I had seen and stories I’d heard, I had specific expectations about what I might encounter at the Jetty when I got there, which I finally did, in 2008. I thought, for example, that I might need a pair of wading boots to walk out onto the spiral. I expected the Jetty to be sparkling white, encrusted with salt crystals. (My friend, the art and media historian Kris Paulsen, told me that Spiral Jetty struck her as surprisingly “feminine,” like “a big doily” floating in pink water.) Mostly, I thought Spiral Jetty would be monumental, as it appears in the aerial photographs. Perhaps it was inevitable then, that I found it so underwhelming, at least initially. I first caught sight of the Jetty from the road: there it was, so unmistakable, so familiar — and yet, so small. Standing at the foot of it, I reassessed: it was not small exactly, but neither was it sublime. Why did this surprise me? Smithson prepares us for as much in his essay “The Spiral Jetty” (1972). “The scale of the Spiral Jetty tends to fluctuate depending on where the viewer happens to be,” he states plainly, going on to draw an analogy between a crack in the wall and the Grand Canyon, viewed according to scale, not size. But Smithson’s essay also employs words like “flickering,” “spinning,” and “gyrating,” to evoke his nearly hallucinatory experience of being at the site. Beneath an overcast sky I stood swatting tiny bugs away from my face and worried that I lack imagination. The lake has now receded so far from the mainland that one can walk between the rings of the spiral, making a bee-line for the center if one so chooses. It was only by walking the full length of the Jetty, however, that I began to have a sense of the work’s true scale. Walking to the center takes some time. The jagged black basalt rocks (no longer coated in salt) require careful steps. Spiral Jetty became a clock and I was the second hand, ticking slowly toward the center (ticking in reverse, technically, as the jetty is oriented counter-clockwise). Once there, I surveyed the landscape, white and barren, and felt that I’d landed on the moon. The sensation of interplanetary travel aside, Spiral Jetty is just two hours from Salt Lake City. Earthworks of the late 1960s and 1970s are generally characterized by their remoteness, their habitation of that vast otherness that is the desert. Even if the desert once represented a “no-place”¹ “off the grid,” artists of Smithson’s generation ultimately had to come to terms with the fact that “outside” and “otherness” was a fiction: the land was already shot through with modes of surveying and surveillance, bureaucratic management and state power. Remoteness is relative, like scale. Earthworks are remote from the vantage point of the art world. These days, I have to admit that my relationship with the Jetty has become increasingly instrumental: I use Spiral Jetty to lure my art world friends to visit me in Utah. “It won’t be here forever,” I remind them. “You know, that whole entropy thing …” The strategy has worked pretty well, helping me to maintain some of the friendships I made back when I was working at SFMOMA. 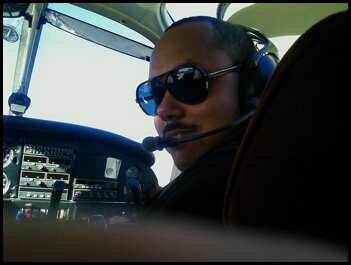 Assistant curator Apsara DiQuinzio came to visit last summer (she chronicled her trip on Open Space), and last fall I flew over the Jetty in a helicopter with Edgar Arceneaux, whose New Work exhibition I organized in 2005. I don’t mean to suggest finally that visiting Spiral Jetty in person provides an experience more authentic or real than the other ways (Nonsites, photographs, stories) one encounters the work. For if Muniz gets Spiral Jetty and its environs slightly wrong, that is also how he gets it right. 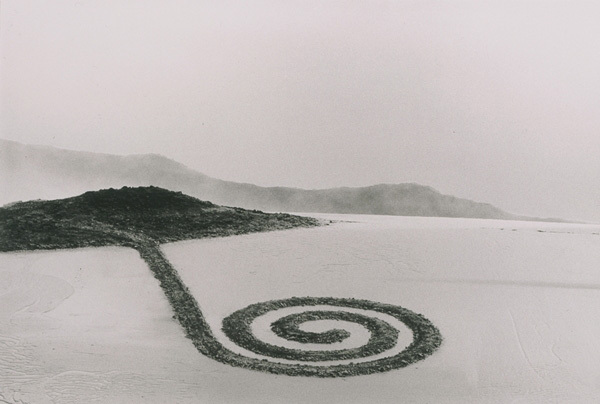 Spiral Jetty after Robert Smithson is a copy that announces itself as a copy, a photograph twice removed from the famous work it references. The jetty’s inaccessibility — because of submersion or (perceived) remoteness — has created a space for mythmaking, facilitated by photography. Visiting Spiral Jetty reminds me that my experience of the work is determined not only by my own perceptions and internal realities, but by so many collective fantasies that precede me. The term is Julian Myers’s. See No-places: Earthworks and Urbanism Circa 1970, Doctoral dissertation, UC Berkeley, 2006. Jill Dawsey is acting chief curator and curator of modern and contemporary art at the Utah Museum of Fine Arts. She was previously assistant curator of painting and sculpture at the San Francisco Museum of Modern Art (2003–6) and has taught curatorial practice at the California College of the Arts and art history at the University of Utah, San Francisco Art Institute, UC Irvine, and Stanford University, where she completed her doctorate in art history. Her writing has appeared in Afterall, Art Journal, Art Papers, and artforum.com. Dawsey is currently organizing “The Smithson Effect,” an exhibition exploring Robert Smithson’s influence on contemporary artists of the past two decades. I like the underlying assumption the Earthworks art is based upon – that art is really important. The fuss, the hassle, the scale, the expense, the remoteness all work psychologically on viewers and take on a life of their own. It’s the sort of gesture that really reflected the times…so it’s nice hear your reflections on it – expectation vs. reality, how the work inhabited a place in your mind, how its function continues to change for you & how its meaning has changed as well. Like many, I have wanted for many years to go to the spiral jetty, and at this point I am skeptical whether I will ever drive through Utah again or otherwise have opportunity to visit, so your blog here is very satisfying as a representation of such an experience–an experience that would be, it would seem, primary, of an actual artifact of the art effect Smithson initiated, but as you make perfectly clear, so is reading your piece about it and imagining it while drifting off to sleep. The proliferation of secondary aspects and virtual or partial experiences is consistent, to my mind, with his sense of the admirable workings of entropy, with which he sought to collaborate, don’t you think? P.S. It was a marvelous coincidence to read your piece immediately before watching Gus Van Sant’s 2001 film called Gerry, which I am sure would interest you if you are not already familiar with it. I am thinking not only of the locations but of the dialogues among frames of reference — material and art, human and non human, sky and earth, time passage and staticity — that are highly pronounced and yet completely implicit from the very start of the film.